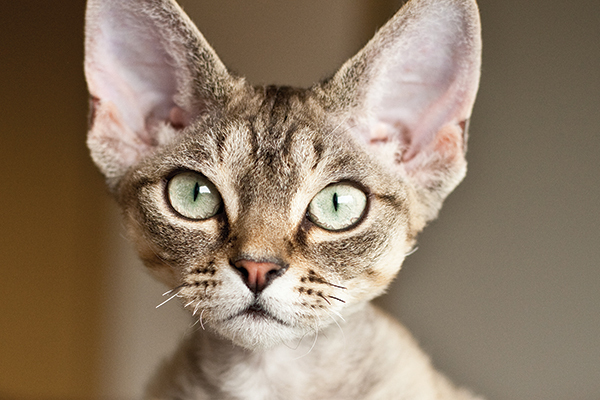 Here’s everything you should know about living with the fun and fabulous Devon Rex! The Devon Rex looks as if he sprang straight out of a Japanese anime film. His triangular head, oversize ears and zany personality do little to deny that this is one unusual cat. He’s the fascinating result of a natural mutation — one that obviously included a gene for silliness. He likes to ride on shoulders, learn (and do) tricks and chatter to you about his day. Clad in short, silky, fine hair, the Devon has a coat that can feel like soft suede, or it can have a whirled and curled appearance. This is a social and curious cat who loves the company of his people. He’ll be unhappy if left to his own devices, so choose this breed only if you’ll enjoy spending plenty of time in his company. 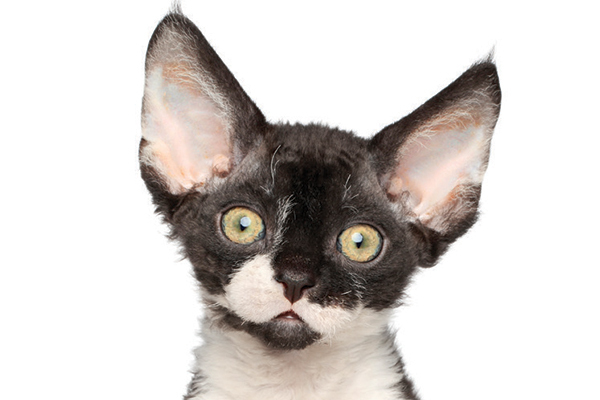 A black and white Devon Rex kitten. Photography by Eric Isselee/Shutterstock. The social and affectionate Devon Rex communicates in a pleasant voice. Trills, coos and chirps supplement the meow and the purr. The Devon Rex enjoys being a lap cat and sleeping under the covers at night. Think snuggling with an animated hot water bottle covered in crinkly crushed velvet. This breed’s “wash-and-go” coat is easy to care for. Rub it lightly with a chamois, or simply run your hand over it. Voila! He’s groomed. However, his naturally waxy ears need frequent cleaning. The Devon Rex is a medium-size cat and typically weighs 6 to 9 pounds. His coat comes in a wide array of colors and patterns, including shaded, smoke, tabby, bi-color and pointed. This breed has a reputation for being hypoallergenic because of his coat type, but that’s not really true of any cat or dog breed. It’s dander (dead skin cells), saliva and urine that carry allergens, and all cats produce those substances. It’s true that some people with cat allergies tolerate this breed, but spend some time with one to make sure. The Devon’s lightly furred body may need a sweater in winter to help him stay warm. The Devon Rex has certain disease predispositions, including hypertrophic cardiomyopathy, the most common form of heart disease in cats; an orthopedic condition of the knees called medial patellar luxation; and hair loss resulting in permanent baldness. 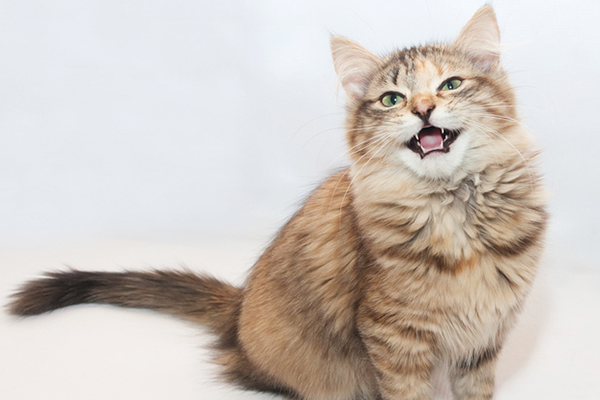 The founding, er, feline of the breed was a cat named — what else? — Kirlee. He was born to a stray cat in Devonshire, England. The woman caring for the cat, Beryl Cox, was fascinated by the kitten with the unusual coat. Over the years, several other kittens in the area were born with “rexed” coats, referring to the genetic mutation that results in soft, curly fur. Cat fanciers became interested in the new variety, which turned out to be unrelated genetically to the Cornish Rex. Kirlee was acquired for a breeding program. By 1967, the Devon had become a recognized breed in Europe, and in 1968 a breeding program began in the United States. The American Cat Fanciers Association was the first organization to recognize the cats as a distinct breed, in 1972. The Cat Fanciers’ Association granted them full recognition in 1983, and the breed was granted championship status in The International Cat Association in 1979. Like a cat with a sense of humor? The fun-loving and playful Devon has been described as combining the traits of a cat, a dog, a monkey and Dennis the Menace. He has a reputation for loving kids and getting along with all kinds of pets. The Devon’s coat molts as kittens mature. The coat may also change seasonally. Cats shed, and the Devon is no exception, but his shedding is less noticeable than that of many other cat breeds. This is not the classic finicky feline. The Devon Rex loves to nosh off your plate and will try exotic items such as olives, asparagus tips or whatever else he can get his paws on. If you don’t offer food, he’ll try to guilt you out of it with sad and hungry eyes. Guard your steak! Kim Campbell Thornton has been writing about cats and dogs for 31 years. She is the award-winning author of more than two dozen books and hundreds of articles on pet care, health and behavior. Her muses are two Cavaliers and a Pomihuahua.